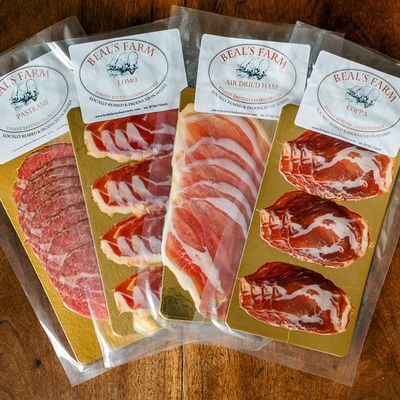 Made from Mangalitza pork reared from Beal's Farm own herd of Mangalitza pigs. The whole loin is dry cured with fresh herbs and spices. 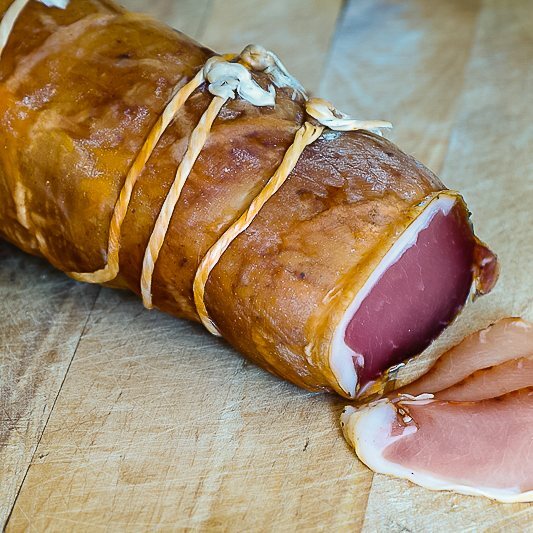 It is then rubbed with smoked paprika and slowly air dried to produce an air dried meat with hints of subtle aromatic flavours, giving a soft texture to the bite. *Wheat, Dairy & Gluten Free. Available to buy in a quantity of four packs, each approximately 50g ( 30 day shelf life) or as a half kilo pack 500g (12 week shelf life). It has been enjoyed by my whole family, tasty in sandwiches , a truly gourmet experience. This product is dispatched by Beal's Farm Charcuterie. This item has a shipping weight of between 200g and 500g depending on the options selected. Artisan British charcuterie made from a heritage rare breed pig, the Mangalitza.